Photoshop's Brushes palette provides a bewildering array of options, sure to confuse even the most diligent explorer. Thankfully, unless you intend to create fine art paintings digitally, you can safely ignore a whole bunch of options. You must have a brush-using tool active to access the Brushes palette. If the active tool doesn't use brushes, the entire palette is grayed out and unavailable. If that's the case, simply press B on the keyboard to activate the Brush tool. The Brushes palette, like the Layer Style dialog box, has a column on the left that lists options. Like the Layer Style dialog box, you mark the check box to activate the feature, but you have to click the name to open that pane in the palette. As you can see in Figure 14-10, the Brushes palette menu offers a pretty normal selection of commands, including the variations in how to display the palette content, some housekeeping commands for resetting/loading/saving brushes, and a list of brush sets at the bottom of the menu. And don't overlook those little lock icons to the right of the various pane names. Click the lock to preserve the settings in that pane while you switch among brush tip presets. Any unlocked attributes revert to those with which the brush tip was created. Locking, for example, Shape Dynamics retains those settings even if you switch to a totally different brush tip. i Brush Presets: Here's where you pick the basic brush tip shape from the brushes loaded in the palette. You can also resize the brush tip, but that's it. Note the lack of a check box in Figure 14-10. You don't activate/deactivate Brush Presets; you just pick a brush tip and size and then move on. i Brush Tip Shape: Also without a check box, Brush Tip Shape is the pane in which you customize the selected brush tip. (Refer to the Brush Tip Shape pane in Figure 14-3.) This is perhaps the most important part of the Brushes palette. 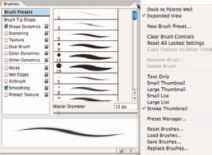 In this pane, you can select a brush tip, change its size, alter the angle at which it's applied, change the height-width relationship (Roundness) of the tip, and adjust the Spacing setting. Figure 14-10: The Brushes palette and its menu — quite a handful! ii Shape Dynamics: Dynamics in the Brushes palette add variation as you drag a tool. Say you're working with a round brush tip and choose Size Jitter. As you drag the brush tip, the brush tip instances (the individual marks left by the brush as you drag) will vary in diameter. 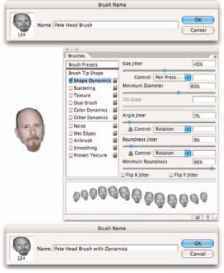 The Shape Dynamics pane offers Size Jitter, Angle Jitter, and Roundness Jitter. Each of the "jitters" can be set to fade after a certain number of brush tip instances or can be controlled with the stylus that you use with a Wacom tablet. Angle can also be set to Direction, which forces the brush tip to adjust the direction that you drag or the direction of the selection or path you stroke. Use Shape Dynamics to add some variation and randomness to your painting, as shown in Figure 14-11. Figure 14-11: Use jitter to add variation to the application of your selected brush tip. ii Scattering: Scattering varies the number of brush tip instances as you drag as well as their placement along the path you drag. Like the shape dynamics, scattering can be set to fade or can be controlled with a Wacom tablet. i Texture: Use the Texture pane to add a pattern to the brush tip. (It uses the same patterns that you use to fill a selection.) Texture is most evident when Spacing for the brush tip is set to at least 50%. i Dual Brush: Using a blending mode you select, the Dual Brush option overlays a second brush tip. You could, for example, add an irregular scatter brush to a round brush tip to break up the outline as you paint. i Color Dynamics: Using the Color Dynamics pane, you can vary the color of your stroke as you drag. This comes in most handy for painting images and scenes rather than, say, working on an alpha channel. Just as you might add jitter to the size, shape, and placement of a grass brush while creating a meadow, you might also want to add some differences in color as you drag. 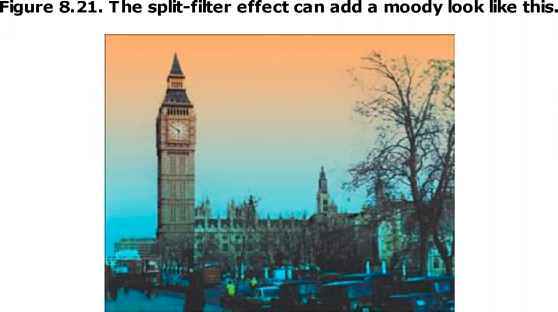 You could pick different shades of green for the foreground and background colors and then also add jitter to the hue, saturation, and brightness values as the foreground and background colors are mixed while you drag. i Other Dynamics: Think of this pane as Opacity and Flow Jitter. You can add variation to the opacity and flow settings from the Options bar as you drag. i Other Options: At the bottom of the left column are five brush options that don't have separate panes in the Brushes palette. They're take-it-or-leave-it options — either activated or not. • Noise: Adding Noise to the brush stroke helps produce some texture and breaks up solid areas of color in your stroke. • Wet Edges: Wet Edges simulates paint building up along the edges of your stroke. • Airbrush: The Airbrush check box simply duplicates the button on the Options bar. • Smoothing: Smoothing helps reduce sharp angles as you drag your mouse or stylus. If the stroke you're painting should indeed have jagged turns and angles, disable Smoothing. • Protect Texture: The Protect Texture option ensures that all the brushes with a defined texture use the same texture. Use this option when you want to simulate painting on canvas, for example. You can use any artwork as a custom brush tip — you can even make a brush tip from your own face! With the artwork on a transparent or white background (you don't even need to make a selection), use the EditO Define Brush Preset command. Type a name (see Figure 14-12) and click OK. Your new custom brush is added to the Brushes palette. After you define a piece of artwork as a brush, you can add that image to any project with a single click or drag. As soon as you define your custom brush, open the Brushes palette, select the new brush, and set Spacing and any other options that you'll generally want to use with the new brush. Then from the Brushes palette menu, choose the New Brush Preset command and resave your custom brush. Now when you select your custom brush, you have your preferred settings all ready to go! Figure 14-12: Define the new brush preset, set your options in the Brushes palette, and resave. i All brushes are grayscale. Regardless of the color in the artwork that you use to create your new brush, the brush itself is saved as a grayscale representation of the art. i Only one color is painted. Again, the brush is grayscale: It applies the foreground color in tints to match the grays in the brush tip (unless, of course, you use the Color Dynamics option in the Brushes palette). i Your art might need more contrast. You might want to convert a copy of your original to grayscale to see whether it wouldn't benefit from a Levels adjustment to boost the contrast. Higher contrast often makes for better brush tips. i Remember to save your custom brushes! Once again (and you'll probably read this reminder a few more times elsewhere in this book), your custom brushes aren't really saved until you use the Brushes palette menu command Save Brushes (to make a new set of all the brushes currently in the palette) or EditOPreset Manager (to make a new set of only the brushes you select). How to open brush pallet in photoshop?